A scientific circus for all ages. Jay Gilligan and Erik Åberg display a series of surprises, synched to the performance of a live original soundtrack. The performance explores where ideas come from, with an emphasis on observation. The overall effect looks like magic, but is even more powerful as no tricks are hidden. Blick uses a self-contained, modular set design which can adapt to almost any space. Kapsel first entered its current incarnation in 2012, since then producing three original circus performances and workshops for all ages in Sweden and the international market. 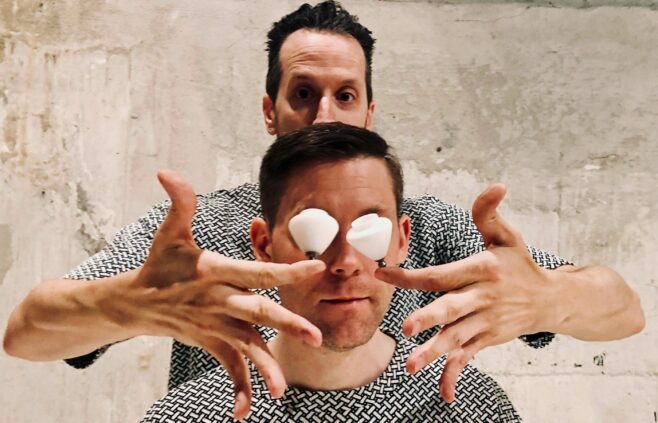 Kapsel has built a distinct reputation for creating poetic juggling performances which treat the audience with the utmost respect. With the support of City of Stockholm, Stockholm Region, Dans i Stan, Region Halland, Kultur i Väst, Bandhagen Art Studio.